July 4, 2013 by Verle L. Bell, M.D. If I am the bride of Christ, what does that mean in terms of my focus and approach to him and to living? You could start with Proverbs 31, the picture of a virtuous wife. She certainly is hardworking, co-ordinating the household activities and buying and developing property. Her goal seems to be to allow her husband to participate in the running of the town. There is a difficult passage in First Corinthians 11 where wives are to cover their heads in church and husbands are not. It seems to suggest that the wife is to bring glory to her husband and he to bring glory to God. This is enhanced by her covering her head. Unlike most of the animal kingdom, the human female is definitely adorned with greater beauty, so I suppose she has to cover her head or no one would listen to or relate to the husband. I think this passage urges me to cover my own “glory” and point all those I meet to my glorious husband, Jesus, the anointed one. For example, God has given me a certain beauty of logic and compassion that could distract people from him and his wisdom in order to focus on me. Yet all my “beauty” is from him and simply gives others a glimpse of his beauty. 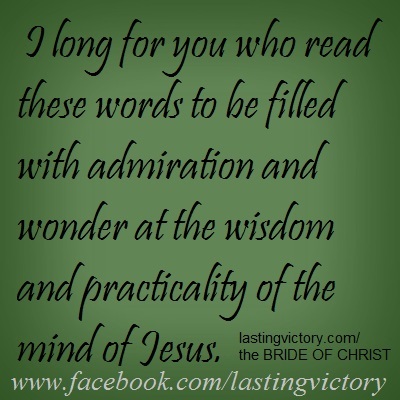 I long for you who read these words to be filled with admiration and wonder at Jesus’ wisdom and practicality..
As his bride I have learned to rest in his strength. Husbands love to be strong for their wives but don’t want to force their strength on them. I must ask for my groom to protect me and be comforted by it and not intimidated by his strength. Don’t you just love his powerful arms? They are so gentle to me and so strong to protect and provide for me. I Samuel 1;8 Then said Elkanah her husband to her, Hannah, why weepest thou? and why eatest thou not? and why is thy heart grieved? [am] not I better to thee than ten sons? HOW DOES THIS CORRECT THE MESS? HOW DOES THIS HELP ME BE A BETTER WIFE? This entry was posted in Uncategorized and tagged BRIDE OF CHRIST, FAITH IN ACTION, HOW TO: outlines on godly living, SUBMISSION, WIFE'S ROLE. Bookmark the permalink. Wow! All those number references to the words of Scripture passages! Very interesting. At first I wondered what they were, but then I clicked on one! Very cool! I took down the links for now to keep the post from being too cluttered. If you enjoyed it, maybe I could do another post with them.